Our "Wings of an Angel" Celtic Trinity Knot Charm Birthstone Necklace is so stately looking. What an amazing design with a beautiful meaning. Look at the angel wings made from Trinity Knots. Added to that is a trinity in the center knot. To finish it off, we have added a trinity to the back of the extender. All of this is masterfully weaved together in a traditional Celtic knot-work. We can add as many birthstones as you would like now or they can be bought later. Put your stone,children's, grands. it could be a friendship or sister necklace too. That is the great thing about custom. You PICK! Made in the USA. This 316 L Stainless Steel necklace is adjustable from 16-20" One size fits most everyone. -Sterling Silver and Rhodium over Lead Free Pewter Center Charm. -316L Stainless steel adjustable chain with a trinity knot to finish it off. That means NO tarnishing or polishing this chain. 3. 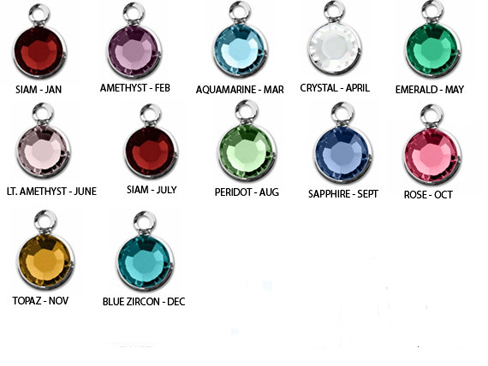 If you want your birthstones put on in a partcular order, please leave us a note during check-out in the note section.